Day 2: First mountain stage from Kathmandu Valley up to Daman, continuing Bandipur /150KM Into the Himalayas we ride… On our Enfield Bullet Motorcycles. Many curves await us, plus narrow gorges but we also encounter heavy traffic. This is one of the main transport roads from India to Nepal. Just before we reach Bandipur in the late afternoon we have a spectacular view at the majestic peaks of the Himalayas, weather permitting. We take an evening stroll through the “museum village” Bandipur where we also spend the night at the topmost place in town. Day 4: Pokhara – Tatopani – / 100 km. We will be leaving Pokhara on our motorbikes towards Beni – 80 km on a perfectly good road, also serviced by regular buses going to Beni. But after that the road from Beni to Tatopani is quite a different story. That is to say, as long as there is no rainfall we have no problems – but when it rains it will be a mud-fest. At least it is all pretty much level, so no going up hill. But it is always an adventurous ride, that’s for sure. In the evening we visit the hot springs; overnight stay at “Daulagiri Guest House”. Day 5: Tatopani – Tukusche – / 35 Km Tatopani – Ghasa 13 km This is a landslide area and the riding motorcycles can be quite demanding, especially 5 km before reaching Ghasa, but when the rain has gone so have the mudslides. There are always heavy duty road excavators on site to keep traffic flowing. The last 5 km are quite steep with big boulders obstructing the passage, also sand. But hey, when the going gets tough – the tough get going……we had a lot of fun here on our last motorbike tour! Ghasa – Kalapani 14 km This stretch of road has the steepest passages, on your right you will find a precipice. Just before reaching Kobang we regain our sure footing. A close-up look at the Annapurna, one of the most difficult 8.000 m peaks in the world. 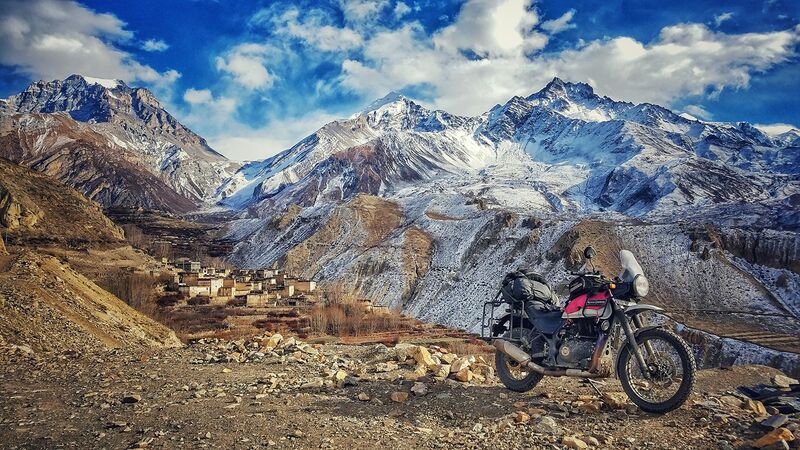 Kobang – Tukusche 8 km – Motorcycle Ride between Two Icy 8000mts Peaks Now we will be flanked by two 8.000m peaks and ride our motorcycles right through the middle. A river crossing over a wide suspension bridge, and again spectacular photo ops featuring the icy peaks of giants, there will be enough time to take pictures but we want to reach our day’s destination One has the chance to take a small hike with a super view of the Dhaulagiri. Day 6: Tukusche – Muktinath : Total trip 31 km. Day 7 : Muktinath – Kalopani / 42 km We drive back the same route we came with plenty of time to enjoy the countryside. You will enjoy the almost luxurious respite, we’ll grab some burgers facing two 8.000 m peaks. Day 8 : Kalopani – Tatopani / 30 km – The Challenging “Off Road Experience” This time we will undertake the challenging “off road experience” the other way round. Hard to believe we did this stretch already…, everything looks totally different from this side. Again the motorcycle ride will be quite demanding and will put a lot of strain on man and machine. When we reach Tatopani, which translates to “hot waters” our weary bones will welcome exactly those. We will again stay at the Home sweet home! Day 9 : Tatopani – Begnas Lake / 130 km. One realizes that we passed through the deepest gorge in the world, the cool climate of the mountains changes into the heat of the jungle which seems to swallow us up. The Himalayas is disappearing into the distance. Just before reaching Begnas Lake you’re in for a treat, pure bike rider’s delight! We will reach Begnas Lake resort late in the afternoon and we have time for a swim or a relaxing Ayurveda massage followed by a tasty BBQ dinner. Day 10 : Begnas Lake – Mugling / 120 km After a late breakfast and a jump into the lake we enjoy some easy “highway cruising” on our Bullet motorcycles to reach the “Riverspring Resort” – time for a pool party. Day 11 : Mugling – Kathmandu – total distance 120 km. We take the “Prithvi Rajmarg” – highway, passing Naubise entering the valley of Kathmandu where the heavy traffic of the Kathmandu ring road awaits us. A careful eye and defensive riding is a must on this short stretch of chaotic main road until we finally reach the old part of town with it’s busy but smaller side streets ending at the in the Thamel district. In the evening we will have dinner together and check out a pub with live music. Day 12 : Kathmandu – city tour, shopping, relaxing / No Motorbikes – 0 Km. Day 13 : Departure Kathmandu – arrival at home. Early breakfast at the hotel afterwards transfer to the airport to catch your flight back home. All drinks, tea/coffee breaks and Hard / Soft drink, visa fees (25 USD Nepal) all travel insurance (accident, sickness, home transport and cancellation costs), return flights to Kathmandu. Though Nepal may be a small landlocked country, the hospitality which Nepal provides here is enormous than anywhere else. Besides nice and friendly people and their world-class hospitality, Nepal has loads of other things to offer. Nepal is rich in biodiversity and possesses beautiful landscapes. There are the breathtaking Himalayas in the north and the evergreen forests which are full of wildlife in the south. Plus the climatic condition of Nepal is very suitable. With things like this Nepal holds great potential for the Eco-tourism destination. Because of these features, these jungles are the ideal and excellent place for jungle safari in Nepal. All these places are the world famous for jungle safari in Nepal. Also, Many documentaries on wildlife from the world popular channels like Discovery and National Geography are filmed in these areas too. Each year thousands of tourists visit these places to enjoy the natural environment at its best. One can easily enjoy the outdoor adventure into the wild and see the wild animals, bird and plants and be one with nature in these areas. Visitors can feel the true wildlife and experience the true thrill and excitement of the wild in these areas. And you can experience all these things with the exotic ride on the back of the elephant. Of course, there will be another option which can be a four-wheeler jeep or any other convenient vehicle. And along with you will be a fully trained and experienced guide who will not only be guiding you but inform you about the surrounding as well. Choose us for the best jungle safari in Nepal experience, our well trained and experienced jungle safari guides will take care about your safety and make your jungle safari in Nepal a memorable and awesome experience. Though Nepal is just a small little country, it is the land of the mighty Himalayas. Nepal is the home of the world’s highest peak Mt. Everest. With eight among the world’s fourteen highest peaks, beautiful valleys and ever running rivers; Nepal is one of the spectacular outdoor destinations that should be explored on the planet. Nepal can be your ultimate destination if you are a water enthusiast because there are a good selection of outstanding white rivers which comes crashing down the foothills from the magnificent heights of the Himalayas. With rivers having personalities from gentle to ferocious which are nourished by the melting snow and off-course the monsoon rain, the world-class destination for rafting in Nepal. Nepal offers countless rivers through which you can experience the true meaning of white water rafting. Plan your rafting in Nepal trips with Shivam Group Holiday. We have teams who are experienced in this business for a decade or more. Our team are experienced in tackling any kinds of problem and all-time motivated to aid the adventurers who are seeking to take their thrills and excitement to the next level. Currently, Shivam Group can arrange your white water rafting in Nepal trip in Koshi, Sun Koshi, Bhote Koshi and Trishuli rivers. And all these rivers are in the top list for white water rafting in Nepal. We have plans and packages that can last from short to long duration and pricing for them is also affordable and transparent in other words there is no hidden or extra fees. Our plans and packages are all designed to fulfil your needs and can be modified if they need some fine-tuning according to your requirement. Come to us if you are interested in wild rides with waves that will flick you into the enraged torrents of water. Come and experience this thrilling and nerve-jangling challenge of white water rafting in Nepal. Experience it once and leave with the thrilling yet satisfying memories of rafting in Nepal.